Tamara Lukyanova and Julia Makoushina, of Palex Languages & Software, have concluded their work on the interesting survey of translation QA tools we announced here in August. From August through September 2007 Palex performed a translation community survey to evaluate acceptance of translation quality assurance tools by the translation community, to define where such tools currently are, their advantages and disadvantages and to visualize their future capabilities and their role in the translation process. In parallel with the survey, Palex tested and benchmarked translation quality assurance tools currently available in the market. Julia has recently given a presentation ("Translation Quality Assurance Tools: Current State and Future Approaches") at the 29th Translating and the Computer conference that took place on 29-30 November 2007 in London. In addition to the presentation (which can be downloaded from the previous link), Julia has also written a paper with the same title. Both paper and presentation are very interesting and well worth downloading (you can do so from the previous links) and reading. 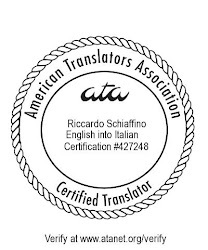 would you be interested in posting a short post about my translation service? How much would you charge for that? Here is my site if you want to take a look at it: http://www.russian-english-translator.com Or maybe you could put my link somewhere?